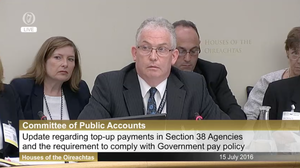 At the Public Accounts Committee. 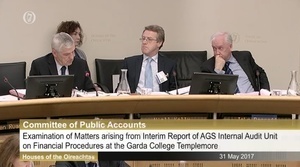 The Garda College interim audit report – which lays out serious financial irregularities at the college in Templemore, Co Tippeary – will be further discussed. Niall Kelly – Head of Internal Audit (author of the audit report); John Barrett – Executive Director, Human Resources and People Development; Michael Culhane – Executive Director, Finance and Services; Ken Ruane – Head of Legal Services; Joseph Nugent – Chief Administrative Officer; Michael Howard – former Head of the Garda Audit Committee. 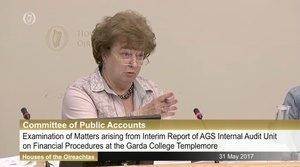 Readers will recall how on May 4, during a PAC meeting, Garda Commissioner Noirin O’Sullivan said she first learned of the issues at Templemore from head of human resources at An Garda Siochana John Barrett during a “very brief conversation” on July 27, 2015 while they were having tea. Mr Barrett maintained it lasted for more than two hours. Further to this, Mr Barrett later released a 122-page file to PAC, which contained a letter he had written to the Chief Administrative Officer (CAO) of An Garda Siochana Cyril Dunne, on September 20, 2015, giving details of the meeting. Those who were present at the meeting included Mr Barrett, Ms O’Sullivan, Mr Dunne, Deputy Commissioner Dónall Ó Cualáin and Assistant Commissioner John Twomey. This letter can be read here. 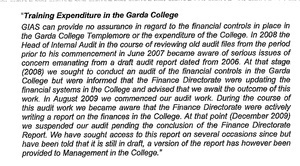 Readers will recall how Niall Kelly explained, in his interim report of February 2017, that he deleted a paragraph (above) from the final version of a report on the Garda College in 2011. He claims he deleted the paragraph after he was assured that the issues were addressed by Executive Director, Finance and Services Michael Culhane. 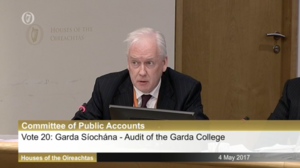 At the PAC meeting of May 4, Mr Kelly said he felt he had been “duped” and that he was caught in the “circling of wagons”. During the PAC meeting, Sinn Féin TD David Cullinane had the following exchange with Mr Kelly and Mr Culhane. Tomorrow’s PAC meeting, in committee room 3, will take place over two sessions, at 9am and 5pm. 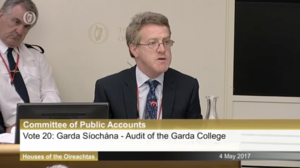 Posted in Misc and tagged Garda college, PAC at 12:17 pm on May 30, 2017 by Broadsheet. Didn’t happen, can’t recall, sim card lost, minutes of meeting lost or misplaced, looking forward, can’t comment, learning from the past, don’t like your aggressive line of questioning, not my area of responsibility. Give me a half million lump sum & €120k pension a year & I’ll retire. and accidental fires. Remember the Kitty diary? If I was a young person I’d be getting de eff out of dodge. And NO IT IS NOT MY FAULT -I never voted for ANY of this – and I resent being blamed for it. Eff off, you piker. You’re the people who glorified these pieces of sh!t. A head of internal audit should insist on receiving written signed assurances otherwise he/she is not doing the job.